Minimum quantity for "Common Stocks and Uncommon Profits and Other Writings" is 1. Widely respected and admired, Philip Fisher is among the most influential investors of all time. His investment philosophies, introduced almost forty years ago, are not only studied and applied by today's financiers and investors, but are also regarded by many as gospel. This book is invaluable reading and has been since it was first published in 1958. The updated paperback retains the investment wisdom of the original edition and includes the perspectives of the author's son Ken Fisher, an investment guru in his own right in an expanded preface and introduction "I sought out Phil Fisher after reading his Common Stocks and Uncommon Profits...A thorough understanding of the business, obtained by using Phil's techniques...enables one to make intelligent investment commitments." First published in 1958, Common Stocks and Uncommon Profits and Other Writings is regarded as a great resource by investors. Its chief author Philip Fisher is regarded amongst the most influential investors of all time. The updated version of this book also includes the perspectives of Ken Fisher, an investment guru and son of the original author. The opinions of Ken are presented in the form of an expanded preface and introduction. The book has been divided into three sections taking the reader through nuances of how to buy a stock to development of an investment philosophy. 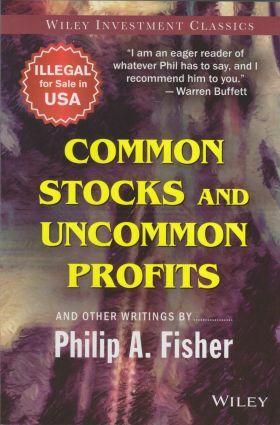 In the first part of the book, Fisher lists 15 points to look for in a common stock. These pointers have become famous as a qualitative guide for companies who are seeking diagnosis. Part one of the book also consists of other basics, including what and when to buy, as well as when to sell stocks. The second part of the book covers the four dimensions of a conservative investment. Part three of the book uncovers a chapter on judging the market and building an investment philosophy. The appendix of the book covers some people factors, functional factors and some key factors in evaluating promising firms. The current edition of Common Stocks and Uncommon Profits and Other Writings was published as paperback in 2010 by Wiley India Pvt. Ltd. It has remained in print ever since. Widely respected and admired, Philip Fisher is among the most influential investors of all time. His invesment philosophies, introduced almost forty years ago, are not only studied and applied by today's financiers and investors, but are also regarded by many as gospel. Common Stocks and Uncommon Profits is invaluable reading and has been since it was first published in 1958.The updated paperback retains the investment wisdom of the original edition and includes the perspectives of the author's son Ken Fisher, an investment guru in his own right in an expanded preface and Introduction.